The Clayton Dive Club deployed a buoy to help protect the wreck of the Schooner Maggie L. located off Clayton in French Creek Bay. Shipwrecks are an important underwater historic resources. Providing a buoy will reduce the risk of anchor damage caused by divers anchoring on the wreck and the buoy will also improve access to this popular dive site. Buoys provide safer ascents and descents for the divers. 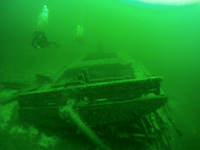 Buoying wrecks in Canadian waters is supported by several dive organizations and the Ontario Government. 1000 Islands Ready Mix Concrete donated the concrete mooring block for the buoy and R J Marine Associates LTD. placed the block on site. The Clayton Diving Club will maintain the buoy and have filled all the necessary regulatory permits before the buoy was deployed. A lighted buoy will replace the temporary holding buoys. The Maggie L. was a 90 foot 2-masted wooden schooner that sunk after a collision with a steel freighter on November 4th, 1927 as she was leaving the main shipping lane towards Clayton. The Maggie L. was one of the last commercial ships to sail on Lake Ontario and the Upper St. Landing craft with morring block.